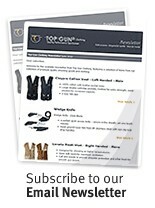 Top Gun supply some of the best quality leather and canvas Cartridge Belts, Cartridge Bags, Gun Slips and Gun Cases. SOME SIZES OUT OF STOCK UNTIL ABT 15/08/16 - check with us for availability (01424719707.. The Grosvenor Cartridge Belt is produced from English saddle leather, has a hand stitched stop ba..
Leather Gun Slip Product code 5-13410 Grosvenor Slips are produced from the finest ..
A stylish and beautifully crafted Loaders Bag that features English Bridal Leather, Fully Suede l..
Cartridge Bag Product code 5-13420 Grosvenor bags are produced in Harness leather ..
OUT OF STOCK UNTIL MARCH 2019. Traditional Cartridge Box Carrier, beautifully craf.. Traditional Cartridge Box Carrier with Fast Loader Hinges, beautifully crafted from English Harne..
Grosvenor Leather Gun Licence Wallet - Dark Havana. Hand crafted, beautiful English Leather Gun Licence holder, currently available in smooth or pebb.. Combining premium grade chestnut leathers and traditional designs the Guardian collection has bee..
Fast loader style cartridge bag with hinged strap. Imported leather goods with an except.. Guardian leather full zip gun slip Imported leather goods with an exceptionally high stan.. Rigid magazine case for carrying up to 300 cartridges Imported leather goods with an exce..
Heritage Canvas Cartridge Bag The Heritage Collection is made in a classic desig.. The Heritage Collection is made in a classic design that combines a heavyweight waterproof lamina..